I’d be willing to bet that you decided to try meditation because it looks so peaceful from the outside: glossy-haired yoginis sitting in an effortless full lotus position directly on a full-grain wood floor are in all of the magazines. We all want that kind of peace — but the truth is, mediation can be much more complicated than just sitting down and focusing on your breath! If you really tried to practice sitting meditation directly on a wood floor, you’d quickly find that your knees would seize up, your legs would have pins and needles, and the strain of trying to keep your spine straight would have you in pain, not peace! Sitting on a zafu or cushion and supporting the spine is essential to cultivating a calm, meaningful meditation. A cushion will reduce pain, align the spine more naturally, and help you rest in mindfulness without constantly thinking about your aching back. Sitting for long periods of time with your back and neck out of alignment is not only painful and distracting for you, but unhealthy! Sitting on the floor in lotus position is the quickest way to pull your back out of whack, and perhaps permanently damage your spine. You really want to make sure your spine is supported and aligned when you’re meditating. Sitting on a cushion or prop — with the spine supported and aligned — reduces blood pressure, deepens your breathing, increases your concentration, and allows Prana to circulate freely through your body, opening the chakras and revitalizing the whole body. This is the real reason we meditate! Sit down and cross the legs. There are several ways to fold your legs: full lotus, half lotus, kneeling (seiza), or Suhkasana, where the legs are crossed in a relaxed way resting in front of you. If you have tight hips or difficulty with your knees or mobility, try meditating in a chair, or laying down in shavasana. These are all great leg options, and there is no judgment about which one you pick! None of these leg positions are better or more proper than the others. It’s really about what is most supportive for your body in time and space: maybe it’s early morning and you want back support, but if you lie down you think you might go back to sleep? Chair sitting might be a good fit. Perhaps you want to meditate but your ankle has been bothering you? A meditation stool might be just the thing. Sit in the center of your cushion or in the middle of your chair so your pelvis is neutral, not tilted too far forward or too far back. You want your spine to stay aligned; if your pelvis is tilted, your spine will follow. You might want to rock a little here to get a better sense of where the center of your zafu is. If you’re sitting in a chair, you’ll want to make sure that you’re sitting far enough forward that your feet are firmly on the ground. Think of your vertebrae stacked neatly on top of one another, and your neck on top of that, balancing a book on your head. You really want your spine rising up and elongating toward the heavens. Don’t let your shoulders crowd your ears! You can even bring them back a tiny bit, opening your fourth chakra and activating the heart. Relaxing your shoulders will relax your whole body. With your elbows bent, bring your hands gently to your thighs, or rest them face up in your lap, touching thumbs with your right hand on top of your left. If you know mudras that you like, you can use those too, but a receptive palms-up pose is just as effective if it works for you. I also tend to meditate in prayer position with my palms together at my heart chakra, which I recommend especially if you need a little more self-love and compassion. Part the lips slightly, which will help relax your jaw and let it drop a little. Bringing the tongue to rest on the roof of the mouth can help you relax and calm your breathing here, as well. You can close your eyes if you want, or you can instead relax your eyes and eyelids and focus softly on a point on the floor about two feet in front of you. If you find that closing your eyes leads to too much “monkey mind” chatter, finding a spot to focus softly on can help calm the mind a little. Don’t stare intently! Think of the 3D posters you used to see back in the day — remember how you had to soften and look through the poster to see the figure? That’s what you’re aiming for. Bodies come in all shapes and sizes, and so does every meditation prop! There are so many that it can be overwhelming to choose one, but here’s a handy guide to help you decide which is best for your sitting practice. The right prop will help you align your spine, take pressure off your knees, thighs, and ankles, and keep you from getting that “pins and needles” feeling. It will help you relax deeply into your meditation and reduce any discomfort you might feel from sitting for long periods of time. You’re seated position can only benefit from the comfort and support of a prop. 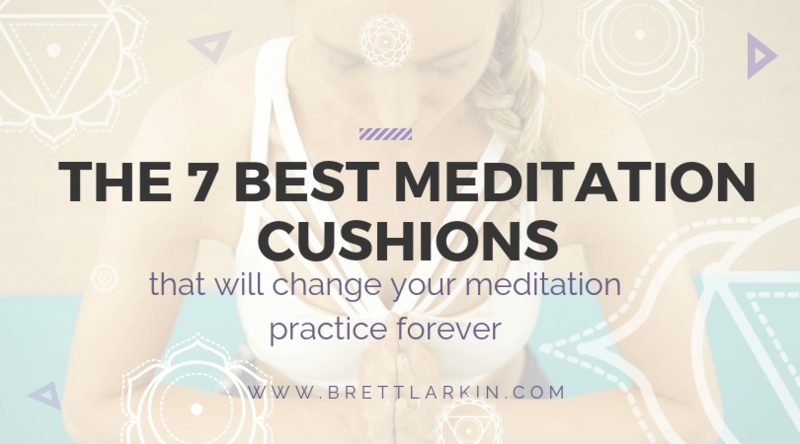 Meditation pillows are also called zafus. Zafus are fat, round pillows that are low to the ground, so they’re best for those of you who have flexible knees and hips as you’ll want to sit cross-legged or in lotus on these. Zafus are often stuffed with organic buckwheat hulls, which gives them a firm texture that supports the pelvis and spine. You can alternatively get them with cotton filling, but I tend towards the buckwheat hulls as they are more resilient and won’t flatten as quickly as cotton from bearing your weight. Zafus come in many sizes and shapes, so look for one that fits your height when you’re purchasing. If you’re taller or have less flexible hips, a larger zafu will work better because it will keep you higher off of the floor and make more room for your knees and legs. Zafus are resilient when it comes to weight, as they’re generally made tough to withstand the hours and hours of pressure of sitting. Height is the largest factor when looking for a good fit. A zabuton is another type of meditation cushion that usually goes under the zafu — these are often sold in a cushion set with a zafu. The zabuton is larger and flatter, used under the zafu for more support and a softer leg cushion. I use a zabuton when I meditate to make the floor more welcoming to my feet and ankle bones! They’re also great for wintery days when the floor is much too cold and you need a little extra insulation. A meditation chair can be a wonderful addition to your meditation practice. There are many different types of meditation chairs — usually, they have some sort of back support but are low to the ground so you can fold your legs, as well. Some meditation chairs are on the ground, and some off the ground depending on your preference. If you already have back problems and sitting on a zafu doesn’t work for you, a meditation chair might be just the thing. When purchasing a meditation chair, make sure you’re checking the sizes. Some chairs are made for people 5’ 9” and under, but some are made larger, like the Friends of Meditation chair on Amazon. I especially like and recommend the classic Back Jack, which is seemingly used at every retreat I’ve ever attended! A meditation stool is a perfect option for those of you who have little hip mobility and would like to kneel or want a higher and easier hip opening. The stool is higher off the ground but has room to tuck the legs underneath so that you can sit with spine aligned, without hurting the knees or hips. Another great thing about meditation stools is that many are portable and easy to carry. Where a zafu and a zabuton can be weighty, a meditation stool can be packed up and carried easily. I love this one in a beautiful purple. Some stools are made out of just wood, and some come with cushions. If you’re a beginner, the cushioned stool is a better option. Plain wood can be difficult to get used to, even for the seasoned meditator. I love this cushion from Sittin Pretty Still with its gorgeous five-petal design. Each petal makes the cushion supremely ergonomically supportive, and it has a zipper opening for adjusting the filling as well as easy washing. Made with organic buckwheat hulls and dried lavender, it smells as luxurious as it looks! Chattra zafus are perfect and classic. They come in all sizes, shapes, and colors, and they’re hand printed using ancient block techniques in ethical workshops in India. They come in absolutely gorgeous colors, so when I’m not using the zafu, I leave it on my couch because it’s so pretty. These zafu and zabuton cushion sets come in multiple jewel-tone chakra colors, round or oval, and also in a large size for those of you with longer legs. Made with 100% organic buckwheat hulls, I love that they also come in Hemp fabric for even more durability. If you have pain when you’re sitting, an ergonomic chair can be a great choice to both support your back and pelvis, but also your knees and ankles. The Ergonomic Meditation Seat by the Grommet lets you sit in an easy cross-legged pose (or Sukhasana) with complete support. Though traveling with the seat may be hard, it’s beautiful enough to display in your home as an interesting piece of art. This deliciously soft, gorgeously stitched Crystal Cove Meditation Pillow is modeled after the ocean waves in California’s Crystal Cove State Park. It’s easily cleaned, and also 100% vegan, so you can rest easy knowing that you’re meditation with props that align with your values. Your lotus pose can benefit greatly from the Crescent Meditation Pillow, which bears the weight of the sit bones perfectly while creating room for the ankles and feet. Beyond the beautiful colors and durable construction of this pillow, I also appreciate that it comes with a lifetime guarantee! Overstuffed, textured, knit cotton, with a quilted mandala top? 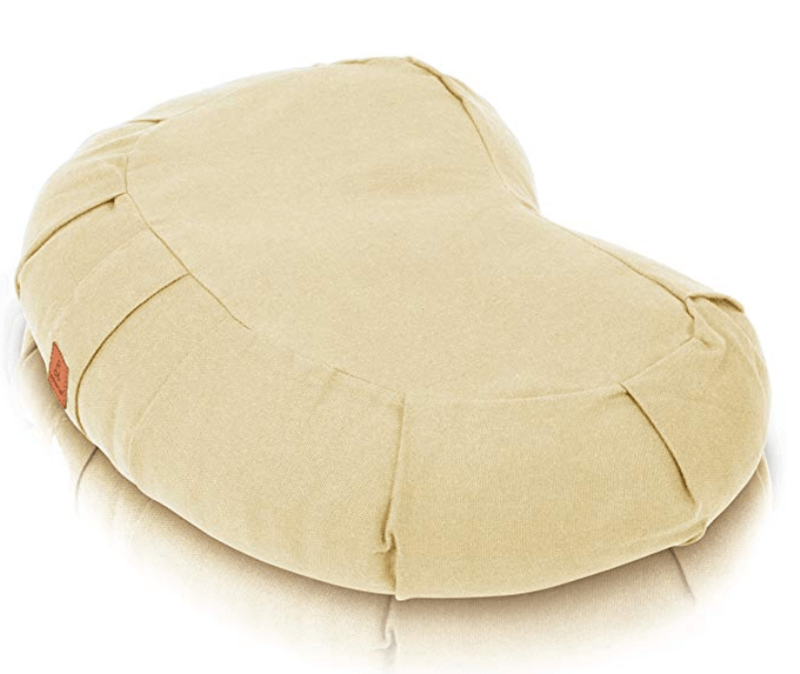 Okay, you had me at “hello.” The Zenjara Yoga Meditation Cushion can only be described as cozy! This cushion is made with all sustainable materials, and is, thankfully, packaged and shipped using no plastic at all.